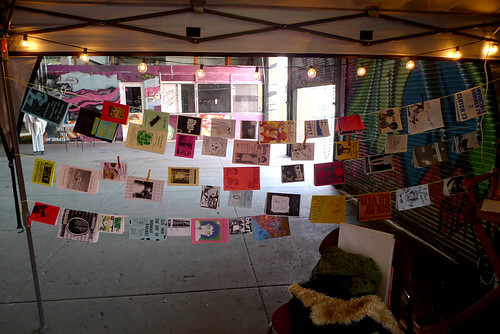 We have been bizzay over here at the Zine Fest. First, there were two awesome days at FMLY Fest. How are you supposed to top two days of free music, eating amazing cobbler, and talking zines with the masses inside a glowing tent? Why even try? New Year’s Eve was crockpot Cuban beans and rice, Chris Lilley comdies, and being in bed by 12:05. Hey, have you checked out our tumblr? 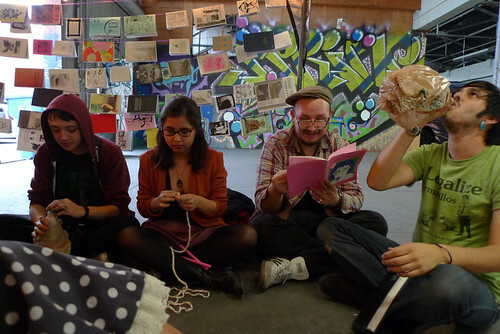 L.A. Zine Fest is lucky enough to have a resident photographer who takes flattering pictures. See our tent at FMLY Fest and other photos from workshops and events that we’ve tabled at throughout the months. Also, see links to cool stuff like Goteblud, the Bay Area’s “premier zine archive” and art installations at Home Room, a great venue that will be hosting some zine events for us in the precious few months leading up to the Fest!